University of Maine at Presque Isle Trustees Professor Kevin McCartney recently published two papers in international science journals. Both papers are about the silicoflagellate double skeletons. These are two paired skeletons that were connected prior to the division of the microorganism into two cells. One of the articles was published in the journal Marine Micropaleontology and the other in the Journal of Nannoplankton Research. McCartney is first author on both articles, which include 12 other authors from eight countries in Europe, Asia and Australia. Both articles are interesting in terms of Dr. McCartney’s scientific career, because they deal with modern organisms rather than the fossils that he usually studies. Five years ago, he found a very rare fossil double skeleton in sediments from northern Canada. This is still the oldest silicoflagellate double skeleton ever found, and first that he had ever personally observed. He found that there was very little scientific literature on the topic, with only a few photographs of the modern double skeletons available. So he brought together a group of scientists from around the world, who supplied specimens or photographs for his study. Right now, McCartney is conducting his “Silicoflagellates Around the World” research trip—an adventure that includes stops in Japan, China and Poland—after being awarded a University of Maine System Trustees Professorship for the Fall Semester. McCartney spent three weeks in Japan finishing work on three more papers. Two of these papers are also on modern silicoflagellates. He has described a new variety and made an interesting discovery that provides clues on the evolutionary history of one of the modern species. He is also submitting an article that describes a new genus. McCartney is currently in the middle of a two-month stay in Poland. While there, his work includes teaching at a short course for international graduate students and work with colleagues on fossil silicoflagellates, from 50 million and 110 million years ago. 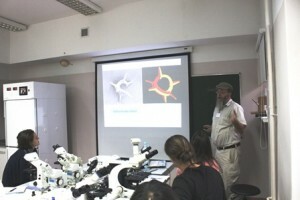 “To spend time on very old, sort of old, and brand new silicoflagellates in such a short amount of time is quite a treat,” he said.